The Chukar (Alectoris chukar) is a gallinaceous gamebird, related to pheasants, grouse, and quail. A medium sized ground dwelling bird, the Chukar weighs in at about 20 ounces and is generally 14-15 inches in length. They are not sexually dimorphic, but that males tend to be larger and more intensely colored, and many have a small “spur” on each leg. Both sexes have buff/grey backs and wings with a grey tinged cap, breast, and rump. The sides are boldly striped with slanting bands of black and chestnut against a white background. The throat and cheeks vary from white to tan, bordered with a black band extending from the top of the bill, down the neck, meeting in a conspicuous “V” where they join on the upper breast. The bill, feet and legs are red. 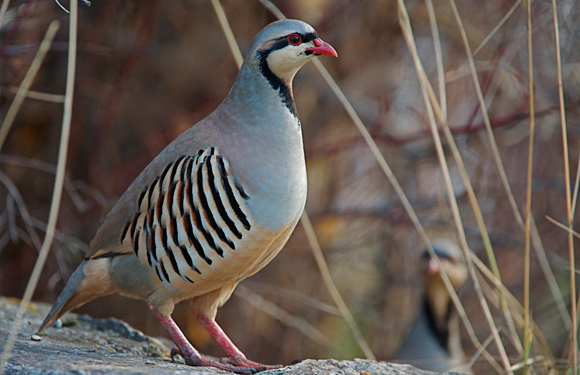 The Chukar is native to many areas of the Middle East and southern Asia, where they live in rocky semi-desert habitats. In the early 20th century efforts were made to introduce the Chukar into parts of North America similar to those habitats in the old world. These areas included the great basin and the mountain/river valleys of the western U.S. which were areas that historically had few, if any, gamebirds. Chukar have come a long was since then and have a wide and varied distribution throughout the west, often living in inhospitable areas. They prefer inclined slopes with cover such as rocks, cliffs, and brush as well as lush grasses and forbs in which to dine. While not mandatory for survival, running or still water sources can be detrimental in years of drought, and higher populations generally occur in these areas. Only a handful of chukar nests have ever been found in the wild, usually under a rock or nestled deep in some brushy cover. They lay 10-20 buff colored eggs that will hatch in about 24 days. While monogamous, the female usually incubates the eggs herself.